Local Raku / Ceramicist "Paul Laycock"
Having recently finished a career in teaching Paul is setting up a small ceramics studio in Thirsk with the aim of turning a long-standing interest into a second career. 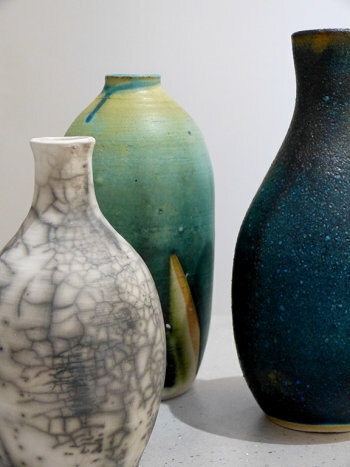 Most of his current work is wheel-thrown stoneware fired in an electric kiln. He has also made two series of raku vessels experimenting with the effects achieved by allowing the glaze to run around the contours of the pot. In some of these it is set against the typical smoky background of raku work; in others he has preserved the colour of the white stoneware clay by using a transparent glaze.